In my many years editing for Carolina Gardener and reading various gardening publications, I became very familiar with the extension agents’ favorite saying: “Right Plant, Right Place.” Basically this means you want to understand the environmental needs of a plant before you put it in the ground. You don’t take a sun-loving zinnia and plant it in the woods, just like you wouldn’t put the shade-loving heuchera out in an open garden with full sun. So when my grandmother gave me a bunch of Lenten rose babies, I did what I thought I was supposed to do. I dutifully planted these shade garden plants in the shade. I dug up a nice little area in the wooded spot of our backyard, right by the bench Bill had bought as a birthday present for me years ago, the beloved bench that has been in three different backyards and is still going strong. I planted them the same fall we moved into this house, in 2008. For years, I watched those plants, pulling weeds around them, watering them when necessary, and nothing happened. Nothing. It has now been eight years, and while those plants are still there, nothing has changed. They still only have two leaves each. They’ve never bloomed, and they haven’t even grown. I read all I could about Lenten roses, and asked a couple of people who were writing for Carolina Gardener at the time who were experts, and the reason for their struggle remained a mystery. After my grandmother passed away, I was helping my parents clean out her garden, and there were multitudes of Lenten roses. The plants kept re-seeding, and no one had been there to keep the population under control. My mom offered for me to take some, and at first I said no. I felt like a failure, because I hadn’t been able to do well with the first ones Grandma gave me. But in the end, I couldn’t resist. I love these flowers, the greenish-white harbingers of spring, and I’ve always wanted them in my garden. So I tried again. This time, I really wasn’t worried about whether they survived or not. After all, I knew where I could get more. So I recklessly planted them in front of our house beside a couple of rose bushes. A non-shady, mostly sunny area right out in the open. Totally against everything I’d known about the perfect spot for Lenten roses. But I needed something for that space. And you know what? These two plants have grown like gangbusters! After two years, I now have big, healthy plants, and this spring I was blessed with a full spray of blooms. I’m not saying you should ignore cultural requirements and plant with reckless abandon in your garden. I can’t explain why the plants did better in one spot than another. All I can say is, I’ve learned that it pays to experiment a little. These little flowers that bloomed so beautifully in a place where they shouldn’t have grown well showed me that stepping outside your comfort zone just might be a good thing once in a while. 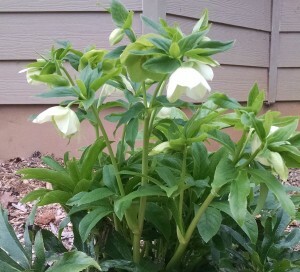 Maybe I can learn a thing or two from these beat-the-odds Lenten roses.